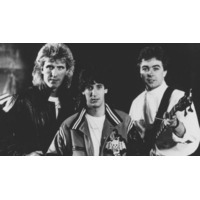 The Outfield are an arena rock-influenced British pop rock/power pop power trio based in London, England. The Outfield are unusual for a British band in that they enjoyed commercial success in the U.S., but never reached the album or singles charts in their homeland. They began recording during the mid-1980s, and they released their first album, Play Deep, in 1985 through Columbia Records. The album reached #9 on the Billboard 200 list and then reached triple platinum in America. Their single "Your Love" reached #6 on the Billboard Hot 100 as well as #7 on the Mainstream Rock chart, and it became their signature song. It went on to be featured in a number of 80s-themed compilation albums, and over 1,000 covers and remixes by other artists have been released online. The other singles "Say It Isn't So" and "Everytime You Cry" also made it into the top 20 on the Mainstream Rock chart. The band continued to record and tour through the 1980s and then into the early 1990s. While their sophomore album, Bangin', hit the top 20 on the Billboard 200 list had both singles hit the Top 40 Mainstream Rock chart, the group began losing their popular audience by their third album, Voices of Babylon, in 1989. Drummer Alan Jackman left and, now as a duo, they recorded Diamond Days in 1991. After the disappointing response to their 1992 album Rockeye, which represented a shift towards progressive rock and arena rock, the group essentially disbanded in the 90s. They resumed touring in 1998, and thereafter released two live albums via their website. The band's latest album, Any Time Now, was released by Sidewinder Records in March 2006 and constituted a comeback to their traditional pop rock sound. In mid-2009, the Outfield entered a London studio to begin recording their 7th studio album. Although popular interest in the band has waned since their 80s musical heyday, their group had maintained a devoted fan base among followers of the power pop genre.